I arrived at Brother’s at around 6pm on a Wednesday evening and, though it was only half-full when I arrived, it became quite busy as the evening progressed. It is not a large place at all, but it manages to seat 75 or so without being overcrowded and is open and airy with a décor that is a cross between chicly modern and pub-style comfortable. I was greeted and seated immediately upon arrival and the young lady who served me was very friendly and helpful in discussing the various menu selections. I was most impressed when, after telling her that I wished to take my time and enjoy a leisurely few drinks before eating, she said ‘if you aren’t in a rush, then I am not’. She was as good as a word and helped to make my general experience relaxed and enjoyable. 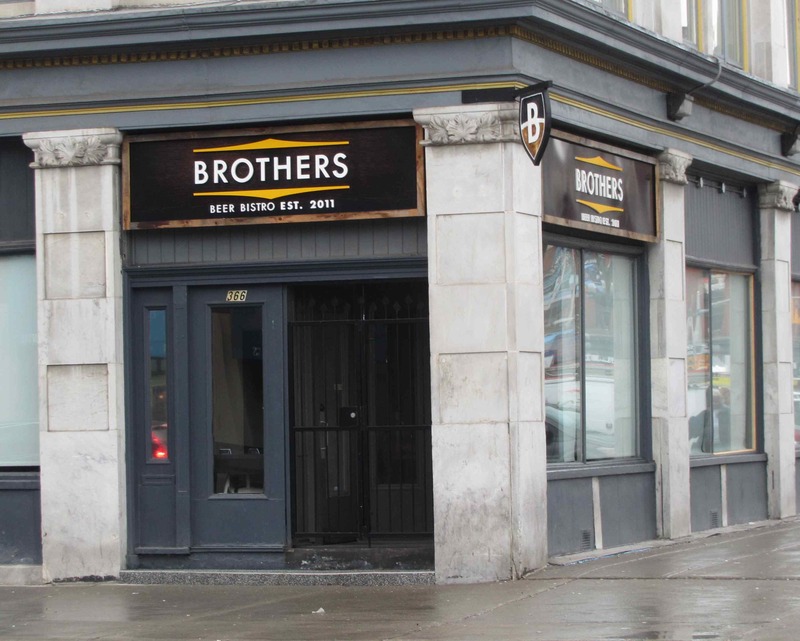 Brothers touts itself as a ‘Beer Bistro’ and, indeed, they have a pretty good selection of drafts and bottled products from all over the place (with a couple of specialties coming in at $25 for a 750ml bottle, I noted). The food menu is fairly short, listing 6 appetizers, 5 mains, and there are some charcuterie and cheese combinations available as well as deserts. There are suggestions for beer pairings rather than wine pairings given and, I was surprised to learn, each menu, including, apparently the sweets, item uses beer somewhere in the preparation. I didn’t get to peruse them but, in addition to the dinner menu I was given, there are also lunch and late-night menus as well. 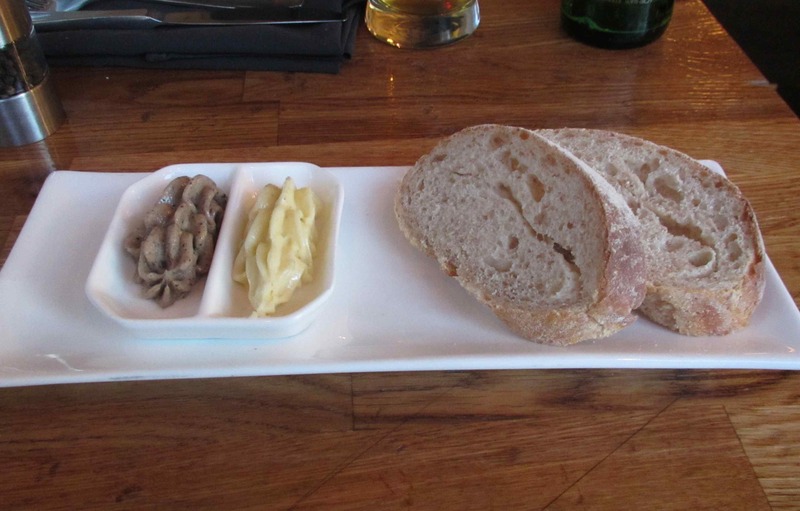 Before ordering, I was given a small platter of bread along with two butter preparations, one made with a stout and one with a light beer. The bread was fresh and very nicely done (though whether made on the premises or not I neglected to inquire), but I have to confess that, after having just finished two very rich stouts, my palate was a bit too ‘jaded’ to fully appreciate the subtleties of the butter. 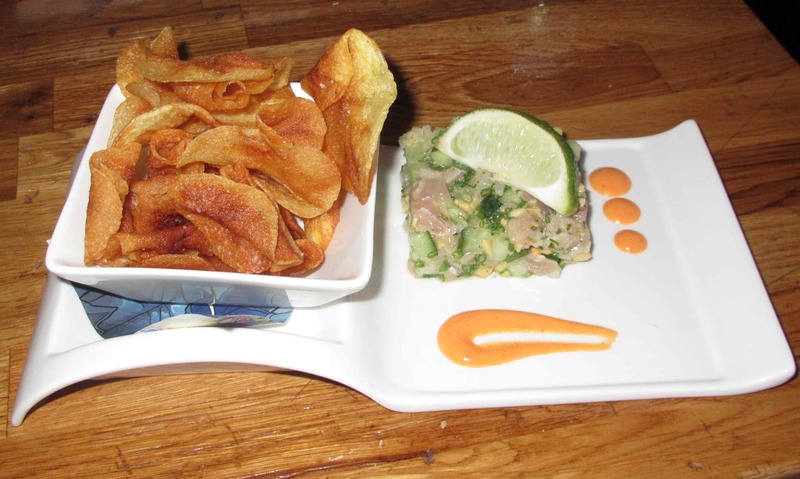 Tuna Tartare – This appetizer selection was described as fresh Albacore Tuna with cucumber, peanuts, paprika aioli, lime and house made potato chips. It was quite nicely presented, I thought, but a little lacking in the execution. The cucumber really dominated the tuna to the point that I could barely taste the fish and the choice of cut for the ingredients was too chunky and not really right. Smaller cubes would probably have been better, or even a thin julienne maybe, but as is, the effect was jarring and unsubtle. The peanuts added a nice textural quality, and were a nice idea, but the lime didn’t work well and the aioli was rather insipid. The chips were actually very good, if not wildly exciting, and I actually had to restrain myself from eating them all so as not to spoil my main course. Overall, I rated this at a 3 out of 5. 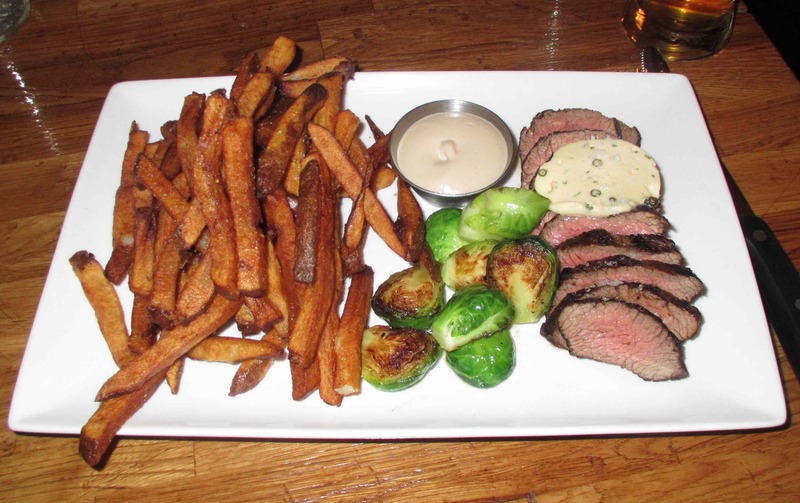 Steak Frites with Roasted Brussel Sprouts, Malt Aioli and Dead Guy Butter – In ordering my main course I as torn between this particular offering and a duck entrée that the waitress recommended. As I had eaten duck the night before I went with the steak instead and, I have to say, I was a little disappointed. I ordered the steak medium rare and, though nicely charred at the edges, it was a little overcooked. In addition to being pre-sliced for me (which I dislike when it comes to steak), it was quite dry, very chewy, and, I have to conclude, just not a very good cut. The sprouts, although nicely caramelized and a lovely fresh green color, were not cooked all the way through, and the fries (a difficult item to mess up) were overdone and bland. Again, as with the previous dish, the aioli was weak and uninteresting and I could only rate the dish, as a whole, at a mediocre 3 out of 5. (Oh, by the way, the Dead Guy Butter was butter blended with ‘Double Dead Guy Ale. I tried the ale and it was pretty good. The butter was nondescript). 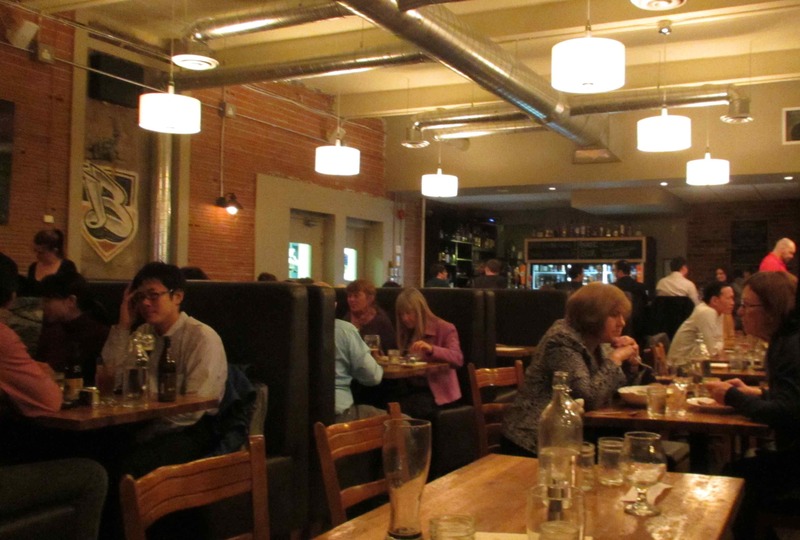 Even though the two dishes I ordered were less than well-executed, I enjoyed excellent service, some really good beers and a pleasant atmosphere. I would be happy to give the menu another chance sometime and I rate the overall experience at a decent 4 out of 5. I would never have thought of putting ale in butter. I agree with you: better to drink it!